Available from April, two new afternoon teas have been added to the menu of the Intercontinental's Wellington Lounge. 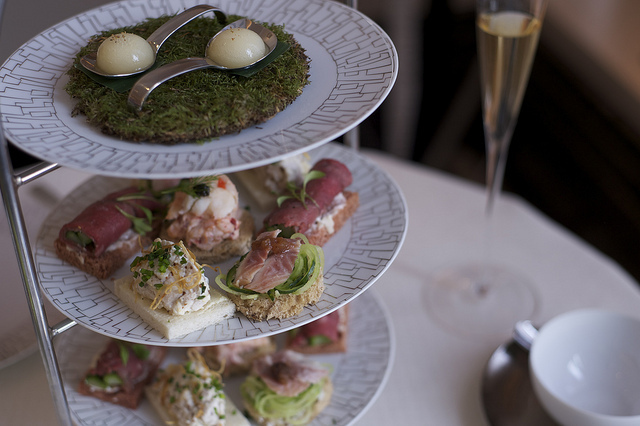 As chic and contemporary as the setting in which they are to be served, the Botanical Tea (just in time for spring) and the "Royal-Tea" (just in time for the Jubilee) are both creations by Executive Chef Paul Bates. Londonist got dudded up all smart casual like and headed round to Mayfair for a sample of Bates' Botanical Tea. At £35, it's a very comfy and intensely elegant experience. And for those who want to have their dainty delicacies and eat them too, you'll be happy to know this tasteful yet playful tea is as artfully prepared as it is presented. Starting off with a cardamom and vanilla infused Champagne cocktail followed by a “botanical drop palate cleanser” made with Kentish pears and sprinkled with juniper with lots more equally herbaceous, floral and fruity flavours after that. The tea's savouries provide more wallop than their crustless mini-sandwich confines might suggest. Smoked eel, horseradish, cucumber and apple relish yields big flavour as does nettle marinated asparagus rolled in Sirloin of beef. As you might imagine, Scottish lobster and shrimp with Sevruga caviar and fresh dill is a pleasurable morsel as well. Citrus peel and buttermilk scones (served warm on our visit) are baked to perfection and remind the palate that even such a staid dish can still delight. Home made quince preserve, strawberry jam and Devon clotted cream do them delicious justice. Onto the dessert service, coconut and fennel white chocolate torte is a particularly wow-worthy way to wrap things up. As for the actual liquid teas, they are a treat too. There's a wide selection (16 in all) with a couple of blends (the Wellington Blend and the Number one Park Lane) only available at the hotel. Londonist went with the Number One. A black tea blend of “Madagascan vanilla pods and marigold flowers”, it intrigued with every sip. The Wellington Lounge is located in the lobby of the Intercontinental London Park Lane Hotel, One Hamilton Place, Park Lane, W1J 7QY. Reservations for the afternon teas are recommended. Disclosure: Londonist visited the Wellington Lounge upon invitation by the Intercontinental London Park Lane Hotel.